Not many artists are able to hold the bragging rights that Minnesota’s T.T. does. At an early stage in his career, the young emcee has scored a smash collaboration with two of the biggest names to ever come out of the Midwest. 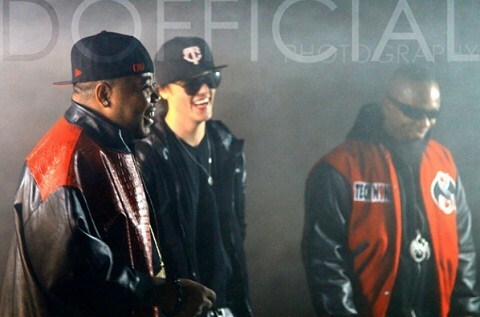 Teaming with Tech N9ne and Twista, T.T. hit the ground running with “Midwest Meltdown” and immediately catapulted himself into the independent spotlight. Despite rubbing shoulders with two Midwestern monsters of rap, T.T. remains level headed and has used the recent notoriety to expose the world to his unique brand of hip hop under the independent Marathon Music Ent. label. We recently caught up with T.T. and Charlie Thompson of Marathon Music Ent. to discuss T.T.’s beginnings and just how “Midwest Meltdown” came to be. From using Tech N9ne’s music to prepare for hockey games to collaborating with the man himself, T.T. shared some insight on what it’s been like to come up on the indie scene. For anyone who may not be familiar with you, what can you tell us? TT: As you can see, I’m a white artist from Minnesota. I was a Division 1 hockey player that always had a passion for music and kind of got to the point where the passion just overtook everything else. Went along the line of going toward music, so the last three years here, I’ve been really focused on the music. You just mentioned that you were an athlete. What was it like making that change from sports to music? TT: It was actually a very big change. I was always a hockey player, but I always used music to get away. It kind of just came to me and I started writing music. It just kind of took off from there and I knew this is what I wanted to do. You’re on Marathon Music Ent., which is an independent label. What kind of experiences have you picked up on the indie scene? TT: It started about close to a year ago and it’s Marathon Music Ent. We put together me and three other people I do music with. We came together and made this record label, which we are pushing independently as much as possible. Charlie: A lot of tough lessons right away. Making sure that…one of the things that we’re making sure as an independent label, is making sure that all of the legal aspects and organizational documents are done properly. With Tech and Twista, because of their record companies, all of those things have to be done properly and it’s been a real experience for all of us in that realm. TT: You know, it’s been easier working with independent artists. There’s quicker responses, but working with people like Tech and Twista, that was more of an honor for me. I’ve always liked both of them growing up, I mean Tech and Twista – you know, Chicago, Midwest – that was more Do or Die in the beginning and then all the way up. Working with Tech was a huge honor. I’ve been going to Tech shows since I was thirteen years old. I used to get ready for hockey games by listening to Tech N9ne music, so it’s been a great honor for me to work with them at such an early stage in my career. Let’s talk about “Midwest Meltdown”. How did the concept for that come about? TT: I just started listening to the beat and writing to it. You know, originally, it was just “Fire”, but you go on anywhere and everybody or their crew has a song called “Fire”. I didn’t want to get lost in all that, so I chose “Midwest Meltdown” because all three of us are from the Midwest. It’s different for me because my style of rap is a little bit slower and smoother than Tech and Twista’s, which is the quick flow, but I wanted to get all different aspects on the song from the Midwest to come out and hit all different crowds. Most emcees might feel intimidated by Tech N9ne and Twista. Were you at all nervous to record the track or do the music video? TT: I was nervous, a little bit with them coming out and their status, but I’m confident with my music. To me, it wasn’t being nervous, it was more being excited. Those are two very respected names. The video shoot was a lot of fun. We started off in the morning getting stuff together and it was quite hectic. Once Tech and Twista got there, the atmosphere changed completely. Everyone was having fun and another thing that was cool about Tech was that he was very good with me and Twista. It was like he made everybody comfortable instead of nervous, which I thought I was going to be. It was different, they were cool and they were there for a while. It wasn’t just in and out. What kind of response has there been to the single? TT: A lot of people have liked it. It’s different coming from me because a lot of people haven’t heard my other stuff. I have a lot of stuff to back it up here. We have a lot of music coming out after this and this is just sort of the kick off to get things going. Charlie: What’s interesting when you talked about the video is that Tyler had a vision of how he wanted it to look and put it all together. That’s sort of an art form in itself, doing that. Like he just said, this is going to be a tremendous catalyst to people knowing who he is. A lot of responses are, “Who is he?” We have a new mixtape coming out in the next couple of days . The rest of the songs for the album will be coming out, we planned it out to be dropped over the next two or three months and we’ll be finalizing the album probably in May. Any last thoughts for the fans? TT: Obviously that it was an honor to work with both Tech and Twista. I got more music to back it up and be on the look out for more. Are you excited to hear more from T.T. ?